Sherry Coffey, a member of the editorial board, has just been announced as the winner of the $1000 King's Landing Prize for Historical Short Fiction. The prize honours an outstanding work of fiction in the category of short story that narrates an awareness of, and appreciation for, an aspect of New Brunswick history and / or our shared heritage. Coffey received recognition at a ceremony at Government House, the residence of Her Honour, Lieutenant-Governor Jocelyne Roy Vienneau. Here she is pictured with Director of Visitor Experience at King's Landing, Jeff McCarthy. The Fiddlehead Editors participated in a panel at the CCWWP Conference in Fredericton this past weekend. The panel was described as follows: "Editors past, present, and future give brief presentations on what we look for in manuscripts, and how that informs our editorial visions of what The Fiddlehead is or could be." Pictured below are fiction editor Mark Jarman, editor Ross Leckie, and associate editor Sue Sinclair. 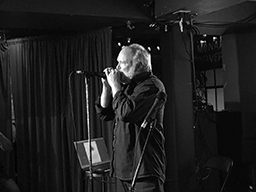 Fiddlehead fiction editor Mark Jarman was a featured reader at the Brick Magazine 99 launch in Toronto on June 5, and he played a bit of harmonica, too! Also, we wanted to give a congratulatory shoutout to serveral contributors. Jenifer Houle won the JM Abraham Poetry Award as part of the East Coast Literary Awards. 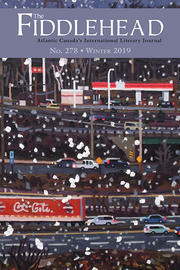 Richard Kelly Kemick won gold in the fiction category in the 40th Anniversary National Magazine Awards for his story “The Unitarian Church’s Annual Young Writer’s Short Story Competition,” which was published in The New Quarterly. And Danny Jacobs was just announced as a recipient of an Arts NB creation grant.